The January-February issue of The Austrian Is Online! 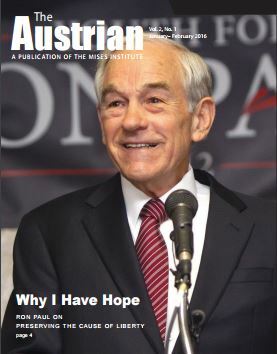 In the latest issue of The Austrian, Ron Paul identifies reasons for optimism in the cause for liberty, and outlines where the movement should go from here. The legendary Ralph Raico sits down for an interview. He offers an historical perspective on the weaponization of democracy. In time for election season, James Bovard outlines the numerous, insidious ways in which government promotes its own agenda by bribing voters. This issue offers a look at our sold-out Mises Circle held November in Phoenix, a note from Jeff Deist and exciting announcements regarding supporters, alumni, and scholars around the world!